The plan for Hamisa to move to the US has been on for the last couple of weeks and now that she is there, the mom of two will hook up Rick Ross and Drake’s ex-lover, Lira Galore, who invited her last month. This trip would not have come at a better time than this when all efforts of having Diamond Platnumz as hubby seem to have failed. Hamisa was over the weekend hosting an event in Houston Texas, pics of which are yet to be unveiled. It's not clear at this time how long the Madam Hero singer will be in the US, but what is clear is that she has to at least meet Lira Mercer, aka Lira Galore to see how best Hamisa can exploit her modelling and social media influencer opportunities. Hamisa got to the US four days back and her camp that is very excited about the development felt this was yet another step in putting on Zari's shoes and walking in her footsteps. Days after Zari was in Mozambique, Hamisa went there and as Zari went to the UK to celebrate her birthday, Hamisa is seen headed right to the USA to try and 'compete' with the woman who has made life difficult for her. "You are not easy to replace," were the words Hamisa used after temporarily winning Diamond Platnumz's heart, but weeks later, she was being tossed up and down with sorcery claims as the father of her child continues to make good with Zari Hassan just in case she changes her mind and takes him back. 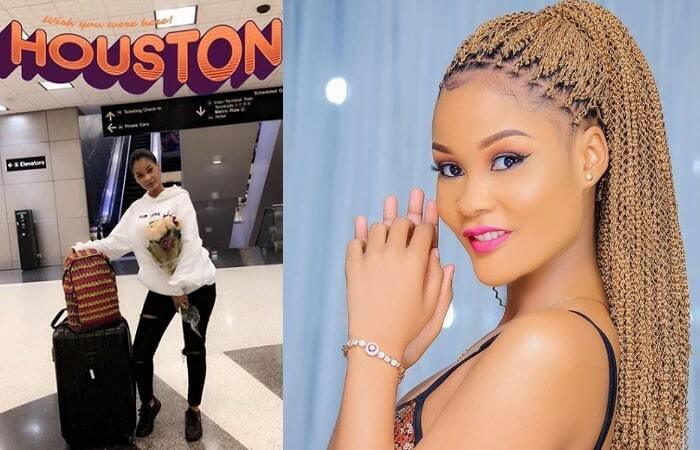 Still talking of Hamisa's trip to the US, this is a big achievement in her camp as it has earned her a title of sorts, 'The only Diamond Platnumz's ex who has stepped foot in the US' and this calls for an update on her "CV."